Right next to our beloved Defence Bakery, we found a spanking new place called Cafe Yell. It calls itself a boutique cafe and has everything you need for a quick coffee date. We love that it acts as a funky extension to the Yell store that’s sat in Defence Colony market for years. 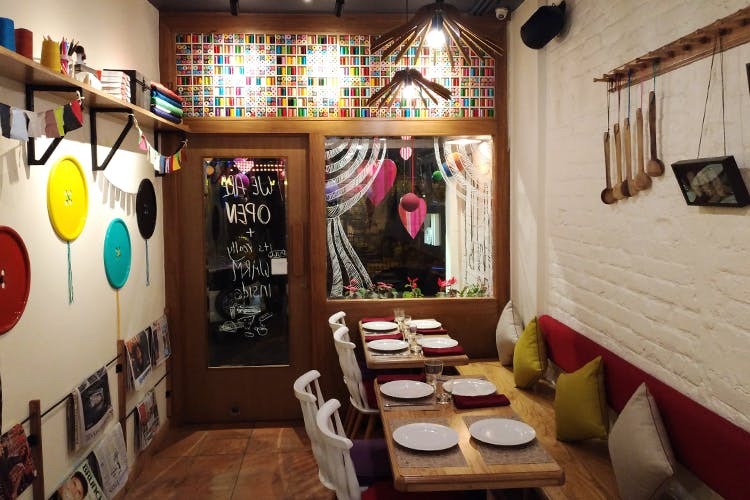 Belonging to the same owners, Vipul and Divya Gupta, it celebrates a darzi’s creative corner with odds and ends strewn around rather artfully. Think big buttons on the wall, sui-dhaaga kits, chalk boxes, hangers, measuring tapes from wayward branches and sassy scissors. Good thing you’ll have all the time to notice these fun elements if you’re hoping to patch things up with bae here. If you’re flying solo though, you can sit by the window and watch the world pass by as you munch on bruschetta. Either way, the cafe will be a welcome change from the expensive, wannabe spaces that have sprung up everywhere off late. Whether you’re celebrating cheat day or just hoping to drown your everyday misery in a bowl of aglio olio, this cafe isn’t where you go expecting something avante garde. It’s dainty and does try its best to make you happy with a lovely cherry tomato and pesto pizza but often, life deals you a slightly crumbly cheesecake and you go on and forget about it, because hey, even the best of us aren’t perfect. Cafe Yell reminds us of good times when we were less stressed, less demanding and more appreciative of the little things in life. The cafe’s eager to impress and has a really cosy, chatty-neighbourhood-aunty-vibe but the menu’s a bit of everything from an Indian thali to peri peri chicken. So we suggest you stick to alfredo pasta and garlic bread.